You have never seen so much mud in your life. Such was one runner heard to say at the end of The Dark Star Marathon 2016. Now if I’m pushed, it’s not the wettest or muddiest trail race I’ve ever done, but it comes very close. I think Steyning Stinger was possibly worse. 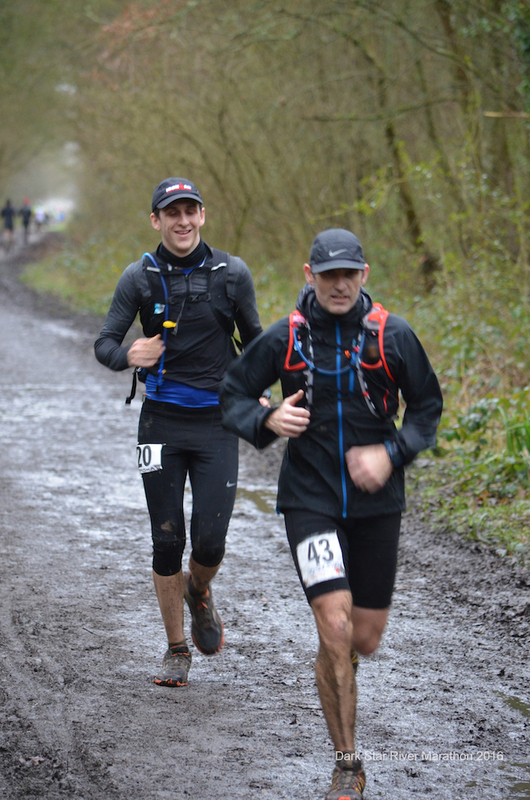 The Dark Star Marathon is organised by Sussex Trail Events and is an out and back course. It follows the east bank of the River Adur for 10 miles and then takes a left on the Downs Link trail as far as the old West Grinstead railway station. 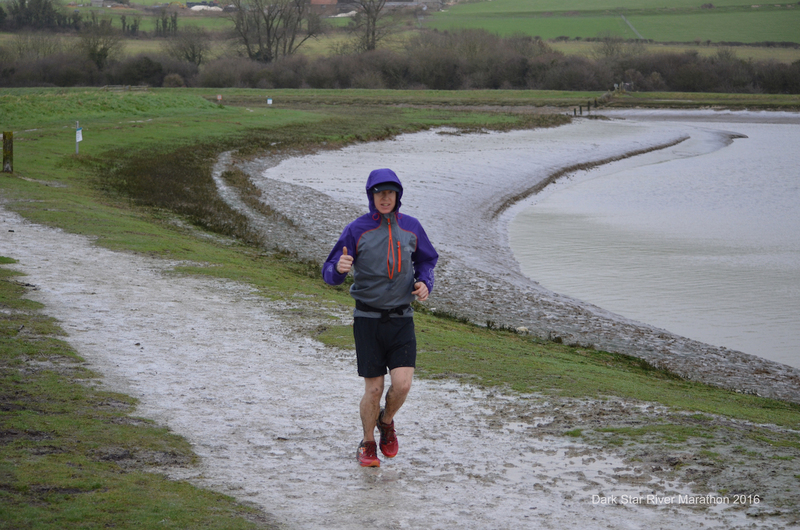 There is an aid station here where you turn and head back down 4 miles of the Downs Link and then rejoin the river bank, this time following the west bank all the way to the start/finish at Shoreham Scout Hut, next to Shoreham Airport. It’s one heck of a 28 mile route and is now in its third year. The first year was hell by all accounts. It was freezing, windy and wet. Many runners were so frozen they couldn’t grip to remove their shoes or clothing afterwards. Last year wasn’t so bad. It was cold but the sun was out and because the ground was frozen it wasn’t muddy and was fairly easy to run on. This year was probably bang in the middle. The weather was much more mild. I didn’t need gloves or a buff and I only had one layer on under my jacket. That’s pretty amazing for me seeing as it only takes a small drop in temperature for me to start adding layers here, there and everywhere. However, it had been raining….a lot. It was raining on the morning of the race. As a result the river bank was a complete quagmire. Anything but deep lugged trail shoes was going to have you sliding and falling at every step. Even with Mudclaw or Speedcross on you would have to concentrate very hard to stay upright. I am a huge fan of Altra trail shoes. My Lone Peaks are possibly my best running related purchase. But I knew they wouldn’t hold me up in this mud. So I made a drastic decision. 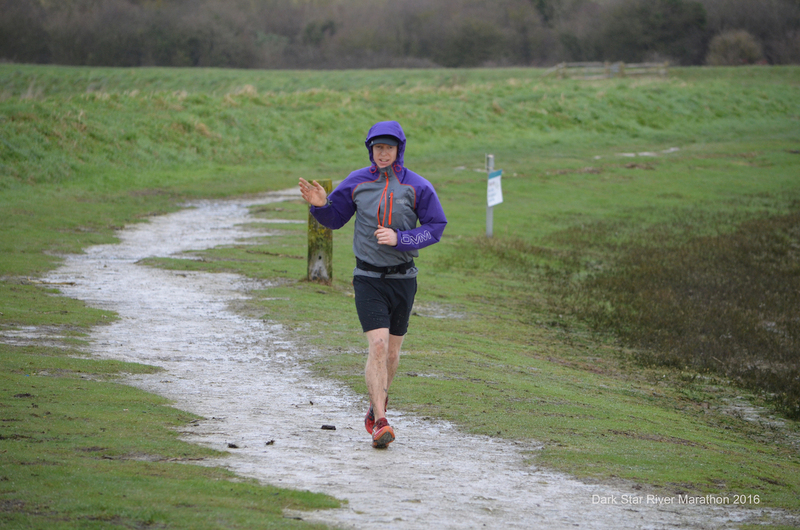 For the 2016 Dark Star Marathon I chose to wear my Salomon Speedcross 3…..which are a size too small for my feet. I wore them for a few races back at the beginning of last year, including Dark Star. I found that on steep downhills they wrecked my big toes. So I put them away and hadn’t worn them since. The Dark Star Marathon was going to be a is flat affair though. So I considered that I would risk losing a toenail in order to stay upright for as much of the race as possible. I didn’t even put the Altras in my bag. 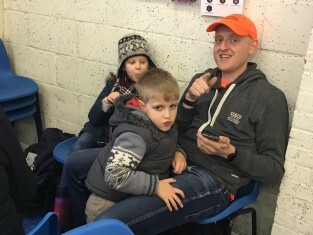 There were around 130 runners gathered in the Scout Hut for Jay’s race briefing. 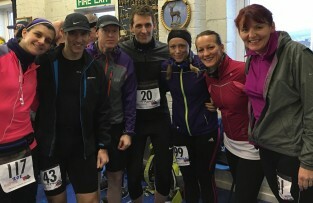 Many familiar faces, many Facebook friends and a smattering of my fellow club runners. Richard (obviously), Sharla and Thomas are are fairly regular fixtures at these events. Between us Richard and I have now run over 60 marathons and ultras, most of them together. Sharla is a veteran of some 10 or so marathons and Thomas is the new boy with a couple of marathons to his name. 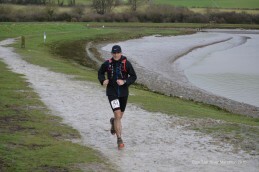 Favourite to win was Stuart Mills of Sussex Trail Running. 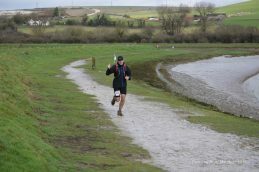 He has won the Beachy Head Marathon 8 times and is also Race Director for the Weald running events. Richard and I ran the High Weald 50k last year and you can see that video here. Stuart told me he had watched my film of last years Dark Star to get an idea of the course. 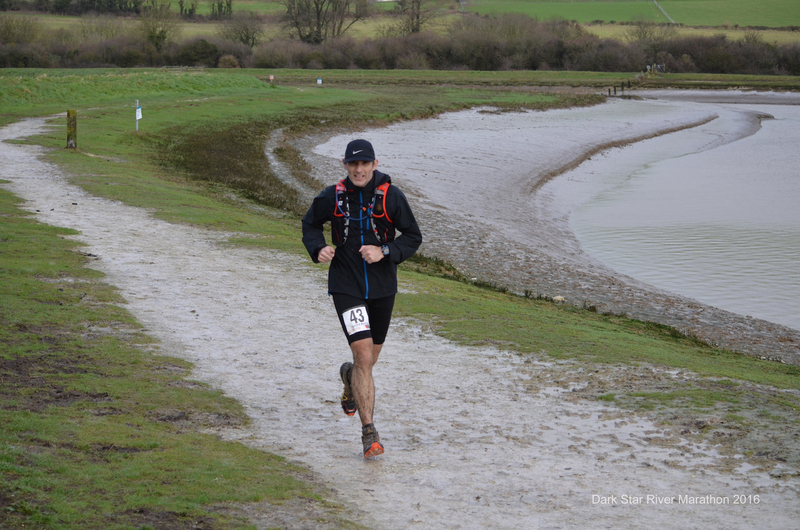 Also in the running was Paul Sergeant who won the Downs Link Ultra event in October 2015. Having filmed this race last year, the film of which you can see here, I decided not to film this year. Turns out, given the weather and the mud, that this was probably a sensible idea. It also gave me a chance to see how I could do on the course without any distractions or extra weight. The Dark Star Marathon 2016 set off at 9am and from the car park at Shoreham scout hut and headed south to cross the main road bridge over the river. This got us to the east bank where we turned left and started running north up the river. The first kilometre or so is on paved or concrete path past flats overlooking the river and then on part of the old Downs Link railway line, before we really hit the mud. For the next 15 kilometres the going underfoot was soft! It was drizzling but not pouring. It was cold but not freezing. Stuart and Paul headed the field. Richard went off ahead and Thomas and I ran together. It was hard going most of the way out. There were obviously some sections that were easier than others and a few sections where the mud was really bad. Thomas and I kept together all the way to the top of the river section. I hadn’t remembered the course very well because I could have sworn the river section was only 7 miles, but it was a good 10 before we finally reached the Downs Link. It was lovely to turn off on to the Downs Link trail and actually start to get some speed up. From that turn it’s four miles on hard pack path and a small section of road running to reach West Grinstead railway station. Stuart Mills and Paul Sergeant passed us other way back, miles ahead of the third placed runner and some 4km ahead of us. Thomas and I were making good time though and we were catching Richard. We could see him up ahead and he did appear to be tiring somewhat. All three of us reached the aid station and turn point at West Grinstead Station at exactly the same time, just under 2 hours in. Thomas said he was going to stop and drink. I grabbed a quick Coke and started back. I wanted to keep up the pace on this section as I knew I would slow significantly when we hit the mud again. I felt pretty good so I pushed on. It was nice to see Sharla Elder, Paul Coe, Samantha Leake and others on their way up. There’s an aid station part way on the Downs Links section and Richard’s wife Tanya and another running club friend, Beth, were there to cheer us on. It’s always nice to see friendly faces offering encouragement when you need it. The most difficult, arduous and mentally challenging part of the race was just around the corner. On the Downs Link section I had been running at around 4:40 per kilometre. I turned on to the river bank with 10 miles to go, passing the back markers in the race at the same time, and my pace immediately dropped. I think my first kilometre in the mud was around 6:20. The problem was that this first muddy section had been churned up by 130 other runners coming up the river. It got marginally easier once we got on to the opposite bank, but not much! The rain had stopped by this time and, although it was tough going underfoot, I felt ok and didn’t hit the dreaded wall. I took my usual baby food pouches around 12 miles and had a jaffa cake at the turn along with the Coke. I gulped two more cups of Coke at the aid stations on the way home and sipped Tailwind from my Salomon bladder occasionally. That was it for nutrition and hydration….oh, and one S-Cap every hour. I like it when I pass runners in the second half of a race. It tells me things are going well. I passed around 9 or 10 guys on the way to the finish and I managed to stay ahead of Catlin, the first lady. See, you thought Michelle Obama was the first lady, but no. All the way through I was wondering if I might be able to make it home under 4 hours. As I got closer I really began to think I might do it. However, my maths wasn’t up to scratch. In my head I was running 44kms. Turns out it was actually well over 45kms. Perhaps I wouldn’t have had the legs for it anyway, but I crossed the line in 4 hours and 3 minutes in 9th place. To be honest I am absolutely delighted with that and only marginally irked that I didn’t get under 4 hours. Richard was a bit tired and came home in 4:16 in 13th. Unfortunately Thomas bashed his shin climbing a style and had to walk much of the last 6 miles. He eventually crossed the line in around 4:36. As predicted, Stuart Mills won in 3:32 with Paul Sargent in 5th. He must have tired a little in the second half to have dropped back so far. Honourable mentions to our friends Shelley who had to pull out almost half way, for Sharla who finished in 6 hours and Samantha who came in in 5:25. Well done all. 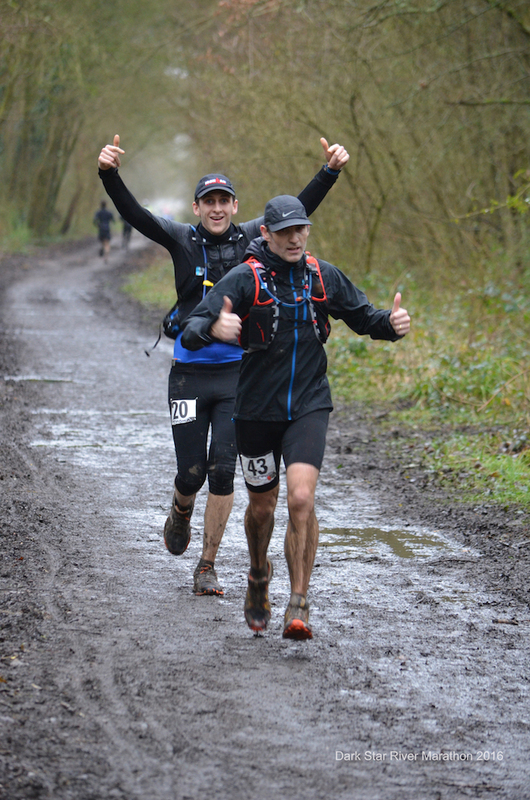 A friend Paul Coe was also running and he filmed this great video of the race, which really shows how muddy it was. Finally, another friend of mine, Keith Fowler, who runs for Worthing Striders, is embarking on a series of marathons in 2016 in order to raise money for Heart Research UK. The Dark Star Marathon was his first and he finished in 4:56. Go and support him at http://runningforad.org. If you have enjoyed this Dark Star Marathon race report and Paul’s video, please don’t forget to give it a ‘like’ or a +1 and share it with your friends. See you at the next race! Also please subscribe to my new YouTube channel by clicking here Film My Run YouTube Subscription. Thanks.